What Was The Sin of The Builders of The Tower of Babel? What Were They Building on The Plains of Shinar? Ishtar/Inanna /Astarte/Ashtoreth/Asherah Lifeless Statues, Or....? Introduction: What Was The Sin of The Builders of The Tower of Babel? I would like to make it very clear.... the Bible never specifically tells us exactly what the significance of the tower of Babel was. Although the story related in Genesis 11:1-9 clearly shows that the tower being constructed was displeasing to the Lord, there is absolutely nothing in the account that mentions what specific sin the builders were guilty of. This lack of clarity has led to a number of different hypotheses, none of which hold water. 1) A few think that the intention of the builders was to "storm" the gates of heaven for which they had to be punished. 2) Others believe that they were guilty of arrogance and presumption, inasmuch as they thought they could reach the heavens with their tower (perhaps become gods themselves)... this only rivalled by their conceit in wanting to make a name for themselves (11:4). 3) One other popular theory is that the men of Shinar were seeking, in some way, to unify the world... without God at it's center. 4) However, I believe that the most common, and most widely accepted, theory propagated by scholars and churches everywhere, is that the builders were guilty of direct disobedience and rebellion. This, based on the fact that almost immediately after Noah and his family came off the ark and offered sacrifice to the Lord, He told them to be fruitful, multiply, and fill the earth (9:1). However the people who had "settled" on the plains of Shinar (11:2) were not particularly interested in obeying this supposed command and did not want to be "scattered abroad over the face of the whole earth" (11:4). And, of course, this defiance incurred the wrath of God. While the above theories may make good Sunday sermons on obedience etc. I am afraid that they neither fit the Biblical facts, nor simple common sense. Therefore, the words.. "a tower whose top will reach into heaven" is, more than likely, hyperbole for their intention to build a very high tower. or an even more ominous reason which we will come to in a short while. What is certain is that saying "They wanted to climb into heaven and dethrone God and enthrone themselves instead." is a classic case of reading far more into the text than it actually says. Additionally, while the builder's expressed wish to make a name for themselves may have been somewhat prideful, one can hardly be seen as a sin big enough to cause God to come down to earth to 'see what they were up to'. Nor was it a problem large enough to warrant what the Lord's subsequent actions, and certainly does not it fit the Lord's comment on the situation (More about this in a bit). Last, but far from least, is the idea that building a city and settling down was a willful act of disobedience to God's command to fill the earth. The problem is that it takes an absolute stretch to interpret God saying "Be fruitful and multiply, and fill the earth (Genesis 9:1) with Him issuing a command to immediately travel all over the earth, produce offspring, and colonize every part of it. In any case these words were a repetition of what God said to Adam and Eve, and those two certainly showed no inclination to leave the garden. Common sense should tell us that if the encounter with the serpent had not happened, Adam and Eve's descendants would eventually have spilled out into the rest of the world. No one was on any particular time table. Similarly, regardless of how big the city was that they built on the plains of Shinar, some stragglers would eventually have moved elsewhere, and they would have been on their way to 'filling the earth'. Few people are nomads... they settle down, they grow things, they eat their crops and drink their wine. In other words, they enjoy their lives. In time as their families begin to get larger, the younger people settle in other places and the pattern is repeated all over again. Besides which, if you want to take Genesis 9:1 as a command, then the "Be fruitful and multiply" part was too. But I hardly think that was to be taken as a command to produce as many children as possible, in as short a time period as possible. Much to the contrary, if we actually read the text, it becomes clear that this was part of a blessing... the bestowal of a divine gift. How we managed to turn a blessing into a command is way beyond me. Sadly, in all our efforts to find an explanation we, by glossing over what the Lord Himself said, have only succeeded in dumbing down the incident. Although we cannot be certain of what exactly would have happened had Adam and Eve taken and eaten from the Tree of Life', it was most definitely not a simple case of the Lord telling the couple not to pluck the daffodils, and them doing it anyway. There was a whole lot more to the story than we have been told. The underlined words are very significant. Although the Bible has not told us the significance of what the builders proposed to do, it is pretty obvious that had the plans been allowed to proceed, there would have been some disastrous consequences. This bears a marked similarity to the Adam and Eve situation. The Lord's words indicated the seriousness of human actions in both cases, but does not explain very much further. Certainly, whatever it was these men had begun to do, it presented a real problem because, as the Lord said, it signified that anything the builders then purposed to do would become possible for them. Any, and all, of the popular ideas about what prompted the Lord to scatter the people and confuse their tongues, such as simple disobedience, the idea that they could, in some way, reach heaven etc. etc. would not have enabled the architects of the Tower of Babel to 'do anything they purposed to do'. Somehow or the other, man has gotten it firmly stuck in his head that God has told us everything there is to know about everything, and since every incident in the Scriptures doesn't come wrapped up in a neat package complete with explanatory notes and commentaries, we tend to interpret the more inexplicable ones by our often very limited knowledge. It simply doesn't always work like this. The Bible tells us that the Father has told us all we need to know to walk a sometimes very treacherous path towards the coming kingdom.... "the sacred writings" are able to give us the wisdom that leads to salvation through faith in Christ (2 Timothy 3:15).. However, He hasn't ever told us, or ever implied, that we know everything, or even very much, about the spiritual world. There are over 290 occurrences of the word "Babylon" and two occurrences of the word "Babel" in the Old Testament, which would probably lead the average reader to assume that two different places were intended. However, if you refer to a Hebrew lexicon, you will find that both Babel and Babylon were 'translated' from exactly the same Hebrew word - bâbel. In other words, according to the Hebrew Bible, Babel and Babylon are the same place. The Hebrew bâbel is only rendered Babel twice... once speaking of the beginning of Nimrod's kingdom and, in the next chapter, referring to the well known story of the tower of Babel. And here is one example of the same word rendered "Babylon". Why this one Hebrew word was rendered differently in different passages is one of the many mysteries that surround the translation of some Biblical words. For example, three different proper names have all be translated "hell" (See Footnote I). The web site Answers in Genesis claims this is a "linguistic coincidence" (i.e. "the same letters BBL are used to write both Babel and Babylon in Hebrew")  which, I am afraid, I do not believe for a moment. I am neither a big fan of convoluted arguments, nor do I particularly care to interpret the Bible according to archaeology, geology, or anything else, especially when there is clear Scriptural evidence that Babel and Babylon were the same place. Remember that Genesis 10:32- 11:4 tells us that some of the sons of Noah "journeyed east" and "found a plain in the land of Shinar and settled there" where they built the tower of Babel. The prophet Daniel recorded that Nebuchadnezzar carried the Temple vessels to "the land of Shinar, to the house of his god". However, the author of Chronicles stated that Nebuchadnezzar king of Babylon took some of the articles of the house of the Lord "to Babylon and put them in his temple at Babylon". That the vessels from the Temple in Jerusalem were in the city of Babylon is evident from the fact that when Belshazzar held a great feast, he allowed his guests to drink from the Temple vessels, obviously stored on the premises in the capital itself. Note: Daniel refers to Nebuchadnezzar as Belshazzar's father. However, in ancient days, the terms father and son did not have the same strict application they do today. In the Bible, although the word "son" is often used in terms of offspring, or biological children, it is also used in a wide variety of other contexts, including a person's descendants or even their dynasty (See Jesus - ‘Son of God’). Belshazzar's biological father was Nabodonius who eventually succeeded the very short lived reigns of Nebuchadnezzar's biological descendants as king of Babylon. However, Nabodonius apparently spent very little time in the city which is why his son, Belshazzar acted as co-regent. This accounts for the fact that after he deciphered the meaning of the writing on the wall, Daniel was made "third ruler in the kingdom". (Daniel 5:29). Additionally, "the land of Shinar" is also mentioned in Isaiah 11.11 and Zechariah 5.11. In both cases, "Shinar" was rendered the country or the land of Babylon in the Septuagint. Quite obviously the land of Shinar and Babylon are the SAME place. Genesis 14 begins with the account of four confederate kings who war against the five kings of Canaan including Bera king of Sodom, and Birsha king of Gomorrah (Vs. 1-3). First listed is "Amraphel king of Shinar" who, along with his partners in crime, overran and pillaged the whole country, making off with all Sodom and Gomorrah's goods, including their food supply (14:11). They also took captives, including Abraham's nephew, Lot, along with all his possessions (14:12). While the exact location of the ancient cities of Sodom and Gomorrah remains a mystery, there is some basis to believe they were located near the southern end of the Dead Sea. Credence for this view is found in the fact that the Bible tells us that these cites were destroyed by fire and brimstone, an alternate name for sulfur. The area around the southern end of the Dead Sea is well known for sulfur deposits and sulfur springs. Also, the Greeks called the Dead Sea "Lake Asphaltites", due to the naturally surfacing asphalt. All of which means that Sodom and Gomorrah were very probably part of the land God had promised to Abraham, which was attacked by the king of Shinar. And, if this is true, what followed the attack is not only of great significance but makes tremendous sense. When Abraham was informed of the raid, he and his trained men went in pursuit (14:14), defeated the kings of Shinar, and brought back all the people and possessions they had stolen (14:16). But what is most significant is that, on his return, Abraham was first met by Melchizedek, king of Salem (later Jerusalem), a priest of God Most High, who brought out bread and wine and blessed Abraham and God, who had delivered Abraham's enemies into his hand. (14:20-21). Abraham then gave a tenth of all the recovered goods to Melchizedek. Without going into details (a topic in itself) Psalms 110:4, and the author of Hebrews, connects Melchizedek with Christ. In other words, as early as Genesis 14, we are given a glimpse of the seeds of two kingdoms... the first represented by Babylon/Babel/kings of Shinar, and the other by Jerusalem. What Was The 'Tower of Babel'? The first question that springs to mind is what exactly Noah's descendants were building on the plains of Shinar. Considering that this particular form of temple was common to the Sumerians, Babylonians and Assyrians, there is more than a distinct possibility that the tower spoken of in Genesis 11 was a ziggurat, a word that may be derived from the Akkadian zaqru, which means tall or massive. These structures were pyramid like, built in several tiers on a square or rectangular platform. Each tier was smaller than the one below, which gave the structure a unique shape, i.e. stepped pyramids. They were built on an immense scale and could be as much as 150 ft tall, with one or more staircases leading to the summit with, very possibly, a temple located at the very top of the structure. To people that lived in small, single story homes, in 'cities' that could not have been much bigger than some modern villages, these ziggurats must have appeared to be truly immense. Note: Because only about three stories remain of the best preserved ziggurat (in Iran), there is no archaeological evidence for the temple at the top. However, in Book I of his Histories (P. 181), the Greek historian Herodotus, who lived in the fifth century BC, mentioned the temple at the summit. Whether this is true or not, there is little question that the ziggurats were dedicated to various gods. One has to wonder if they were built to stretch far above the ground to be closer to whichever god they were dedicated to. The ziggurat of Sippar was called the "Temple of the Stairway to Pure Heaven"
The ziggurat at Nippur was known as 'Eduranki', which means 'House binding Heaven and Earth'. The ziggurat of Larsa was called the "Temple Linking Heaven and Earth"
The ziggurat Dilbat, located southeast of Babylon was also the "Temple of the Foundation Platform of Heaven and Earth"
Genesis 28:12 tells us that Jacob dreamed of "a ladder was set on the earth with its top reaching to heaven; and behold, the angels of God were ascending and descending on it". What is interesting is when he woke, Jacob said this place "is none other than the house of God, and this is the gate of heaven", a comment that appeared to reflect the perception of the time and place. Even more tellingly, the ancient ziggurats were not solitary structures, but seemed to always have some kind of religious complex attached to them, which could consist of a courtyard, temples, altars, storage rooms, living quarters etc. This fits in with the Genesis account that tells us they were building both a tower and a "city". Finally, Genesis 11:3 tells us that the builders said to one another, "Come, let us make bricks and burn them thoroughly." And they used brick for stone, and they used tar for mortar". Since sun-dried bricks did not last nearly as long, important buildings such as ziggurats were often constructed of baked bricks set in bitumen mortar as was the stair case of one of the earliest known the ziggurat built by Ur-Nammu. One objection raised against the idea that the tower of Babel was a ziggurat is that migdãl, the Hebrew word translated 'tower', was a watchtower and often used in a military context. See for example, Judges 8:9-17, 9:51, 2 Kings 9:17, 2 Kings 17:9, Ezekiel 26:9 etc. Quite simply, the Israelites did not have a specific term for 'ziggurat' because these constructions were not part of the Hebrew culture when the Bible was written. In any case, the word migdãl is derived from gâdal, which means to grow, be great or magnify, which is quite an accurate description of the enormous ziggurats. Babylon was founded by Noah's great-grandson Nimrod, and reached its zenith under Nebuchadnezzar in the sixth century BC. The Babylonians worshipped a pantheon of deities (many of whom were associated with celestial bodies) and built impressive temples devoted to them. This kingdom would prove itself a mortal enemy of not only the nation of Israel, but of God Himself. Although the physical city of Babylon no longer exists, the tentacles of its spiritual heritage have spread far and wide. Although it morphed as it went, the connections show just how far spiritual Babylon has dug its claws into the world of men. The other kingdom began with a single man who, very possibly, lived where ziggurats were erected to false gods. He was called out of this land to journey some distance away to Canaan, to sow the seeds of God's kingdom, which will eventually destroy the first. Etemenanki: The ruins of Babylon, the most famous city in ancient Mesopotamia, lie in modern-day Iraq some 60 miles southwest of Baghdad. It was the site of the very impressive seven storey ziggurat, constructed by Nebuchadnezzar as part of the sacred complex in Babylon. The ziggurat was called Etemenanki, or "temple of the foundation of heaven and earth". Some sources say that the kings Nabopolassar and Nebuchadnezzar called this immense ziggurat... ziqqurat Bâbîli, "the Tower of Babylon" . I will build a house to be my luxurious abode. I will found my chamber and establish my kingship. This will be your resting place before the assembly. I shall call its name 'Babylon', "The Homes of the Great Gods"
Nabonidus was the Assyrian-born last king of Babylon, who ruled from 555-539 B.C. However, he was away from the city for long periods of time and had appointed his son Belshazzar co-regent. In fact, Nabonidus was not in the city when it fell to the Medes and the Persians. Anyone who has read the book of Daniel knows the story of Belshazzar, who threw a feast, and served his guests wine in the vessels taken by Nebuchadnezzar from the temple in Jerusalem. Probably while the party was in full swing, a disembodied hand was seen writing something on the wall. When Daniel was brought in to interpret the writing, he told Belshazzar that it meant that the king had been weighed in the balance and found wanting. It wasn't long after that that the Medes and the Persians attacked and conquered Babylon and killed Belshazzar. Aerial view of the Ziggurat at Ur, with reconstructed facade and stairway. foundations of a much older one about two hundred miles south of Babylon. I am Nabonidus, king of Babylon, patron of Esagila and Ezida, devotee of the great gods. E-lugal-galga-sisa, the ziggurat of E-gish-nu-gal in Ur, which Ur-Nammu, a former king, built but did not finish it (and) his son Shulgi finished its building. On the inscriptions of Ur-Nammu and his son Shulgi I read that Ur-Nammu built that ziggurat but did not finish it (and) his son Shulgi finished its building. In other words, the cylinder identifies the site as Ur built during the reign of Ur-Nammu, and describes how Nabonidus reconstructed the ziggurat devoting it to the god Sin. This is noteworthy simply because Marduk had been the chief god of Babylon for several centuries. As a Side-Note, Belshazzar was long considered to be a figment of Daniel's imagination. However, the clay cylinder found in Ur also records Nabonidus asking the gods to bless his son, Belshazzar. In order to figure out who "Sin" was, we have to go back to the ancient Sumerians who worshipped a Moon-god, called Nanna in Sumerian, and Su'en or Sin in Akkadian. 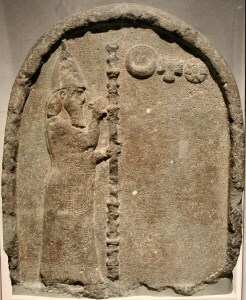 In fact, the Stele of Ur-Nammu (on left) shows the king praying to, or making an offering to Nanna/Sin represented by a large crescent moon at the top of the stele. All of which brings us to Abraham, whom God brought out of the land of Ur, to Canaan. While we cannot know for sure whether the Ur mentioned in the Bible, is the same city once ruled by Ur-Nammu, it seems extremely likely that it was. Abraham traveled northwest from Ur to Haran, then after his father died, he set out southwest to Canaan (See Map). However, his brother Nahor did not accompany Abraham, but stayed behind in Haran. So why did Abraham travel so far out of his way? Very simply, he was skirting the Arabian Desert, going around its northern border. It might have been impossible, or at least far more difficult, for him to have taken the shortest route from Ur to Canaan, across miles of sand. In fact, they probably traveled along, or close to, the banks of the Euphrates for much of the way which, in those days, made a great deal of sense. This actually proves nothing, since 1) there is no evidence for a city called Nahor and 2) the Bible could very well mean that Abraham sent his servant to the city in which his brother, Nahor, lived.. ie. Haran. Man was building a kingdom dedicated to his gods, and Abraham was called out of that hotbed of apostasy to sow the seeds of God's kingdom on earth. As we know, both Babylon and Assyria became mortal enemies of Israel. And, interestingly, Nimrod not only founded Assyria but also built Babylon in the land of Shinar. Sure, Nimrod's Babylon may have been built in some other location in Shinar, but that would have been quite a coincidence. Christian writers have sometimes seen a connection between Sin and the Muslim god Allah. The pre-Islamic Arabs in Mecca worshipped the moon and the sun, with the former being the chief deity. This makes it entirely possible, probable even, that they named this deity ilah, which is the generic word for god in Arabic, and that Islam adopted Nanna's crescent as its symbol. And how is all this relevant to our world? To end division among his people in Mecca, Muhammad elevated the moon god Ilah to the chief and only god... Al-Ilah (The God) or Allah, the Supreme Being. In other words, considering that ancient Mecca that lay just over 1000 miles southwest of ancient Babylon and was "an oasis on the old caravan trade route that linked the Mediterranean world with South Arabia, East Africa, and South Asia"  it would hardly be surprising if the pre-Islamic worship of the sun and moon was derived from the religions of ancient Babylon. In other words, Islam's crescent may have originated with the moon god "Sin". And, if that is the case, the religions of ancient Babylon have very effectively spread all over this planet, and now claims millions of followers. disc of the sun-god Shamash"
Note: Although Marduk was the chief or national god of Babylon, the Ishtar Gate, constructed by Nebuchadnezzar II, was the main entrance into the city of Babylon. 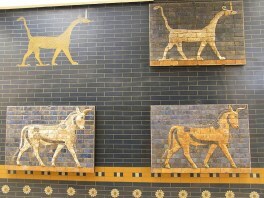 It was named after and dedicated to the Babylonian goddess represented by a lion. 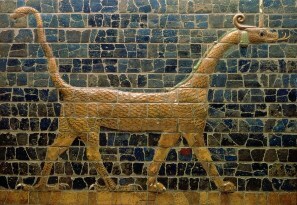 Note: The wall of the Ishtar gate were also decorated with a relief of Marduk's dragon. Like her 'father', Inanna/Ishtar was also associated with heavenly bodies. In her case it was the planet Venus. It is also believed that her descent to, and ascent from, the underworld corresponds with the movements of Venus in the sky. The planet Venus appears to make a similar descent, setting in the West and then rising again in the East. . In summary the Babylonian gods were all associated with the sun, moon, or various planets or stars. Is it any wonder that, in Romans 1:20-25, Paul spoke of fools who worship and serve the creation, rather than the creator? And, as we know from many such verses in the Old Testament, the worship of Sin's daughter Ishtar not only infiltrated Israel, but persisted through much its history. In spite of having everything a person could wish for, Solomon was led astray by his many wives... for which, the kingdom was taken away from Solomon's son (1 Kings 11:33-36). In verses that tell us that King Josiah destroyed the 'high places', Ashtoreth is called "the abomination of the Sidonians". Sidon, probably founded by Canaan's son Sidon (thus Noah's grandson) was located just north of the land of Canaan and had, at one point, been conquered by the Babylonians. The similarity of the names... Asherah and Ashtoreth can hardly be a coincidence. Nor is it very likely to be a coincidence that Asherah is often mentioned in connection with Baal, the sun-god. Remember that Sin the Babylonian moon god had two children - Shamash the sun god and Ishtar (Inanna), the goddess of love and war. Which makes it very likely that Asherah/Ashtoreth is who Jeremiah was speaking of in the following verses. The warnings were many and severe. It is interesting to note that each deity has specific characteristics such as nature, gender and authority, which would probably not be the case if they were nothing but man made lifeless statues. It is more than likely that the physical statues, that provided a point of focus, were representations of very powerful forces. In other words, Nanna, Marduk, Sin, Inanna, Astarte, Isis etc are simply names given specific spirits. Similarly, Apollo was a real personality; Osiris was a genuine underworld fiend; Hecate actually lived, and still does! The Hindu gods 'Shiva' and the eight-armed 'Kali' are far more than images conjured up in someone's imagination. Did the goddess worship die out with the ancient religions? Far from it! In recent years there has been a tremendous revival of goddess worship, usually warmly embraced by the feminist movement. Virtually anyone who is interested in the environmentally friendly 'green movement' has probably heard of Gaia. What they may not know is that Gaia was the primal Greek goddess personifying the Earth, the Greek version of the Earth Mother, and that they believe that 'she' needs to be protected from destructive human abuse. In other words, Gaia is the occult belief that the earth is alive, and has a spirit, and that "she" caused life to spring forth from the earth. It is entirely possible that the 'Tower of Babel', on the plains of Shinar, was a ziggurat which always seemed to have some kind of religious complex attached, around which the city was built, which fits in with the Genesis account that tells us they were building both a tower and a "city". The Babylonian kings were well know for their ziggurats. Nebuchadnezzar, king of Babylon, built a very impressive seven storey ziggurat in Babylon called the Etemenanki or "temple of the foundation of heaven and earth". It was constructed on the foundations of a much older one which, considering it had the same name, could have been what we know as the 'Tower of Babel'. 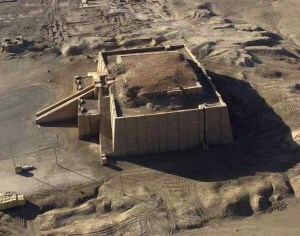 The Ésagila, the most important temple complex in ancient Babylon, lay just south of the ziggurat Etemenanki. It was said to have been completed by King Nebuchadnezzar II and was dedicated to the god Marduk, the patron god of the city of Babylon and one of the most important gods of the time. Nabonidus, the Assyrian-born, last king of Babylon, built another ziggurat about two hundred miles south of Babylon, and devoted it to the god "Sin", who was represented by the crescent moon. Ancient clay cylinders found at the site identified the site as Ur, built during the reign of Ur-Nammu. While we cannot know for sure whether the Ur mentioned in the Bible, is the same city once ruled by Ur-Nammu, it seems very likely that it was. While physical Babylon no longer exists, the influence exerted by the gods it served, has spread far and wide. The pre-Islamic Arabs in Mecca worshipped the moon and the sun, with the former being the chief deity. To end division among his people in Mecca, Muhammad elevated the moon god Ilah, which is the generic word for god in Arabic, to the chief and only god... Al-Ilah (The God) or Allah, the Supreme Being. In other words, it would hardly be surprising if the pre-Islamic worship of the sun and moon was derived from the religions of ancient Babylon, especially since Mecca lies just over 1,000 miles southwest of ancient Babylon. One has to suspect that Islam's crescent may have originated with the moon god "Sin". Remember that "Sin" was also called "Nanna" in Sumerian. 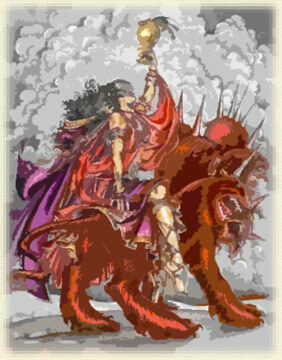 His daughter was Inanna, better known today as Ishtar, who came to play a major role among the Canaanites as Astarte, while the Israelites knew her as Ashtoreth. Worship of the goddess has seen an unprecedented rise in popularity in recent years, particularly with the feminist movement. "Babylon" is not a nation, but a spiritual kingdom, that reached back to Shinar and the tower of Babel, then physically and/or spiritually persisted in the physical kingdom of Babylon, and other nations as diverse as Egypt, Assyria, Greece, and Rome, all of whom wreaked havoc on Israel. This kingdom, the antitheses of Jerusalem, is alive and well, and still endeavors to carry away captives and win the battle. And, until finally defeated, it will extend it's tentacles into the future when spiritual apostasy and pure unmitigated evil will peak under the regime of the beast. There are those that believe that these verses "cannot be understood literally", but are a "metaphorical representation" of the calamities that were coming upon Babylon. While it is certainly true that some awful calamities were described using apocryphal language (Isaiah 34:4, Ezekiel 32:7-8), Isaiah's phrasing is much more in sync with Jesus' words in Matthew 24:29 and Revelation 6:12-14, both of which refer to the final days of this era. Isaiah has the Lord saying "I will punish the world for its evil" (Vs. 11) and that He will "make mortal man scarcer than pure gold" (Vs. 12) all indicate a far more global judgment than that of a single kingdom. Besides which the very specific use of the phrase "the day of the Lord" in verse 9, indicates the end of days. Additionally, the oracle of Isaiah, which foretold the destruction of Babylon by the Medes and Persians, was applied to the end of days by the apostle John in the book of Revelation. 1) Why the proper names... Sheol, Hades and Gehenna were translated "hell". In any case "hell" does not mean fire and brimstone. It comes from an old English word which means to cover over... Hmmm! Sort of the same description of Sheol found in the Old Testament. 2) Why the pronoun "He" is used for the Holy Spirit, when the pronoun in the original Greek is neither gender nor number specific. 3) Why the NIV and several other popular translations render the Hebrew arrhabon as 'deposit' in several cases, when it actually means 'earnest'. Worse, in some cases, they not only translated arrhabon into the English 'deposit', but then went on to add the word guarantee. Unknowingly, countless people have relied on these translations, believing that Scripture actually speaks of a 'guarantee' when, in fact, it does no such thing. There is a world of difference between guarantee and earnest. This "mis-translation" can only be accounted for by a clear and biased Calvinistic bent. Anne Habermehl Where in the World Is the Tower of Babel? Answers in Genesis. Sargon of Akkad (Nimrod) as 'Divine’ .. Shulgi of Ur III . Part Two: Merging Akkad with Ur III. Esagila. Encyclopædia Britannica. http://www.britannica.com/EBchecked/topic/192197/Esagila ]. It lay just south of the ziggurat Etemenanki and was apparently completed in its final form by the Babylonian King Nebuchadnezzar II (604–562 BC). Etemenanki (the "Tower of Babel"). http://www.livius.org/place/etemenanki/. All content copyright © 1995–2014 Livius.org. All rights reserved.